The annual Perseid Meteor Shower is coming soon to a sky near you. The peak of activity is expected on August 12th and 13th, midnight to dawn, but you can start watching for meteors as soon as the sky gets dark. This year, unlike in 2014, the Moon will be absent from the sky. Darker sky allows fainter (and thus more) meteors to be seen. And if you’re lucky, you might even witness a bolide or fireball light up the landscape and leave a persistent glowing trail in the sky. Bolides are fireballs that explode into multiple fragments, each of which can leave a separate trail. I’ve seen dozens of fireballs, and just a few bolides. Some reputable observers have reported an audible distant rumble following the explosion of a bolide. I’ve listened for that, but never heard any sounds. Because typical bolides explode at high altitudes (40-50 km), the sound could arrive up to 5 minutes after the explosion. So if you do see one, be quiet and be patient. The shower is named for the constellation Perseus, from which the meteors appear to radiate. 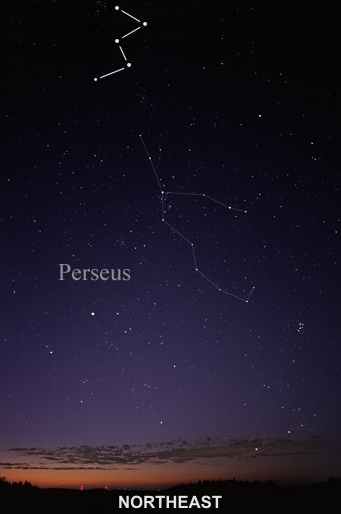 Perseus is not a very bright constellation, but it’ll be just below the famous “W” of Cassiopeia (which is rotated and looks more like a “3” at this time). Click on the thumbnail below for an image of how the sky will appear to the northeast. 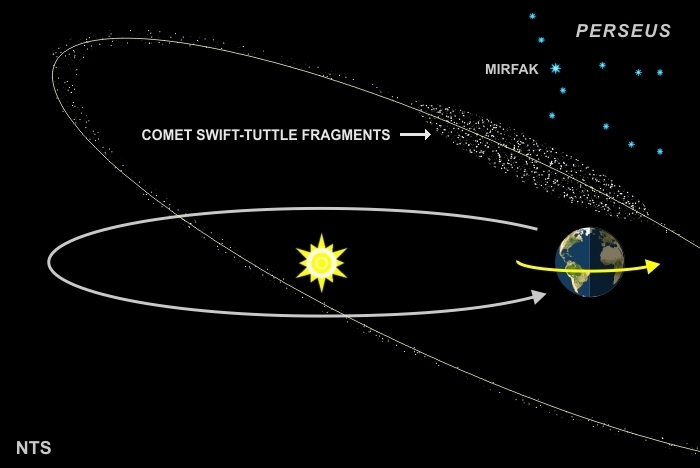 Perseid meteors come from a stream of debris left behind by Comet Swift-Tuttle. This debris orbits the Sun, as does the Earth, but it’s orbit is elongated and tilted in a different plane (top graphic). Over time, the comet debris has dispersed around the entire length of its original orbit. The debris distribution, however, is far from uniform. There are places where that debris is more concentrated. When Earth passes through one of these clumps, you’ll see a lot more meteors. Unfortunately, we don’t accurately know where all those clumps are located. Predictions for any meteor shower, Perseids included, are never more than a “best guess.” For what it’s worth, the 2015 prediction is 80 meteors per hour (during the peak time between midnight and dawn). Of course, that’s for dark and clear non-urban skies. As the graphic illustrates, every August Earth passes through this stream of debris. When that happens, the visual effect is much like what you see when driving a car through rain or snow — all the drops or flakes (or meteors) seem to be coming at you from a point directly ahead. During meteor showers, that point of origin is called the radiant. 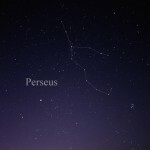 In August, Earth’s motion through space is toward the constellation Perseus. So that’s where the meteors appear to radiate from, and that’s why they’re called the Perseids. So turn off your outside lights, and find a dark location with a clear view of the northeast sky. A reclining lawn chair allows you to look upward comfortably. Give your eyes at least 15 minutes to become dark-adapted. Then settle in for the night, and observe one of Nature’s greatest celestial fireworks displays.